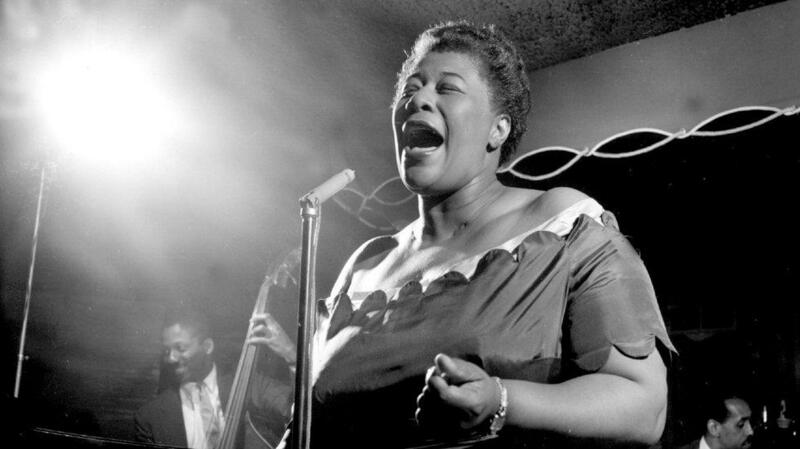 Ella, to me, is the most complete jazz singer in the world. Still. All her records draw me close and always I find pure bliss. She’s on top of all musical aspects. And she was so adorable too. What a legendary voice. What a legendary woman. Her light yet rich timbre always enchants me. Her variations are so well chosen, her playfulness and endless energy are such a delight and inspiration. She brings joy. And then there’s that impeccable timing. That elastic swing. She never dropped a stitch. Never ever. Just try to join her in any song, and you’ll find yourself gasping for your breath. How did she do that? And how can YOU do that? In my family, my father was known for his lung capacity. He could blow up balloons in no time… I assume Ella’s lung capacity was impressive too, but most of all she was a master in distributing her breath and energy over her songlines. She breathed in very shortly and accurately and never lost any time in doing so. She was always ready. Prepared. During lessons, I usually compare it to that state that athletes are in, just before the starting shot. That preparation is priceless. When singing is a daily ingredient in your life, or when you sing professionally, you decide in an instant where to breathe in and how much. It has become an automatism. If this not yet has become an automatism for you, I’ve got some good news! You can train the mastery of your breathing technique quite easily with very simple exercises. I just love simplicity, it makes it so easy to recall and to add to your daily routine. Start with a good posture, straight up. As proud as you can be. Place your feet hip width, and make sure you knees are not overly stretched, because then you’ll curve your back too much. Relax your shoulders. Now imagine pulling in your tail, as if you are a dog, to tilt your pelvis a little. You will feel that the muscles of your belly are activated now. Check in the mirror or practice with your personal coach, if possible! Place one hand just beneath your navel and the other just above your pubic bone. In this area you will feel your rectus abdominis or belly muscles. Breath in through your mouth, and direct your breath towards your hands. You’ll feel your belly slightly come forward, this occurs naturally, because your diaphragm lowers. Make sure that your shoulders are down, keep them in a relaxed state. Hold your breath for 1 or 2 seconds. Breath out in 10 seconds very evenly, while forming an ‘ss’ or ‘ff’ with your lips, so that you can hear your efforts clearly, while you, after 3 seconds, slowly pull in your belly muscles towards your spine. This activity of your belly muscles is the so-called breath support. We dose the outgoing breath by slowly pulling in our belly muscles. When you breathed out all your air, open your mouth and release all tension in your belly muscles. This will result in an automatic inhalation: your lungs will fill with air in an automatic way, and because your diaphragm lowers, your belly will come forward again. The great part of this exercise is that you don’t have to breathe in actively for this new breath. Repeat this exercise, but now, breathe out with an even sharper ‘ss’ or ‘ff’ for 20 seconds. Be very economic with your air, make the opening of your lips a little bit smaller. Sometimes it helps to think of a bicycle tire that looses air through a tiny leak. You felt it coming: repeat this exercise for 30 seconds, and then for 40 seconds or more. Breath in a little bit more and breath out a bit more economic. Challenge yourself! After a while, you may have signaled that your breathing has become more and more efficient. If you repeat this breathing exercise daily, you’ll experience a longer persistence, you’ll have practiced your lower breathing capacities, and you’ll know how to breath in at Ella’s speed when the words in your song ask for it. Isn’t it simple? Isn’t it fun? Now join Ella in her songs!